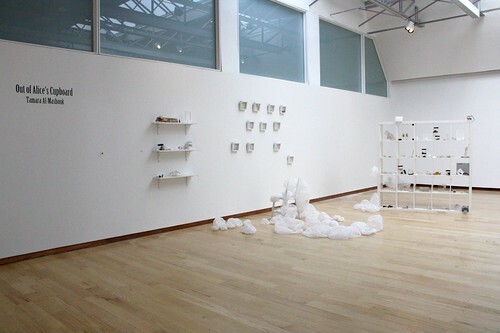 Posted by claralieu in Applied Arts, sculpture. 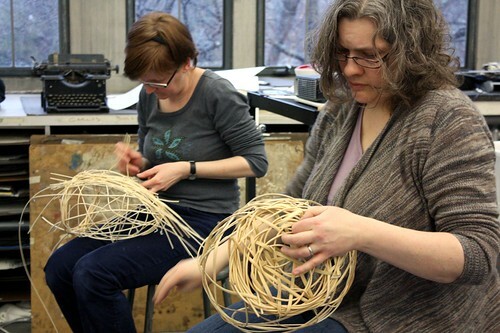 ﻿This past weekend we hosted the Sculptural Weaving workshop with Boston artist Nathalie Miebach, who is also one of the artists featured in the “Transformations” exhibition, currently on view at the Jewett Art Gallery through April 10. 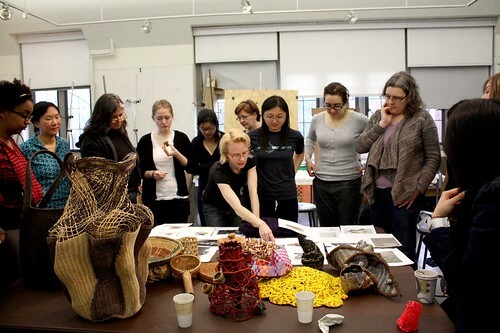 Miebach got the workshop started by providing everyone with a foundation to understand the materials, process, and history of weaving by examining woven objects she had brought in herself, images workshop participants brought with them, and also a slideshow which demonstrated these ideas in more depth. Miebach explained that the weaves have not changed throughout history, but that the materials for weaving have. An example she brought with her to demonstrate this was a small woven bowl, created by the Zulu tribe using telephone wire to weave. 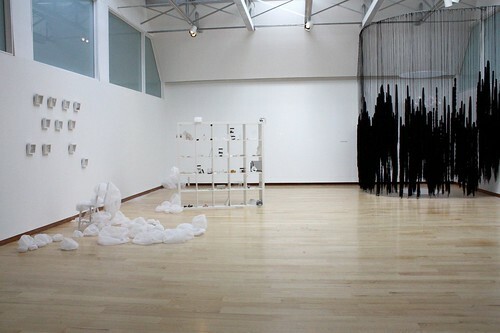 She also talked about how in contemporary woven works that both the materials and forms have departed from being purely functional. 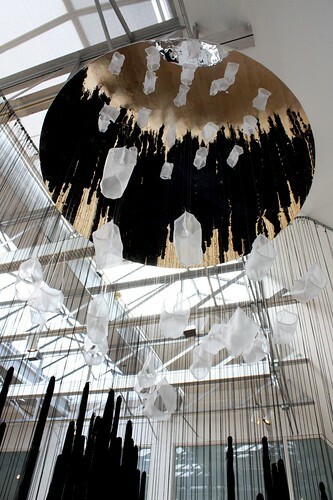 Miebach displays a woven form she created which is based on a calendar of daylight and nightlight hours in Boston. 1) Coiling: a process where a material is wrapped around the reed. An inner structure is created with other forms. 2) Twining: in this process there are “spokes” which are vertical, and are made of a thicker material, and the “weavers” which are horizontal. 3) Plating: in this process, every element of the weave has the same voice. Together, these same elements create a form. Plating often begins flat and is very geometric. Hexagonal plating is a common shape seen in many woven forms. 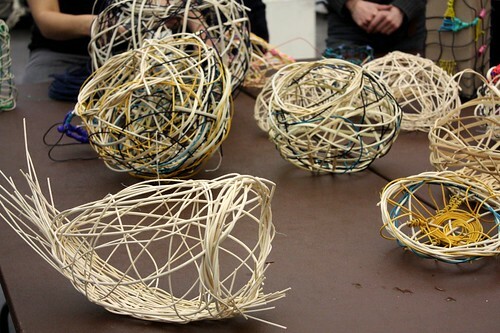 4) Random weave: a weaving process which is based on a bird’s nest. Miebach explained that the bird is the most incredible weaver because it creates the entire nest with only it’s beak. The random weave is probably the most playful of the weaves and has a wide range of possibilities in that the weave can be either very dense or very open. The random weave is surprisingly solid and strong as well. 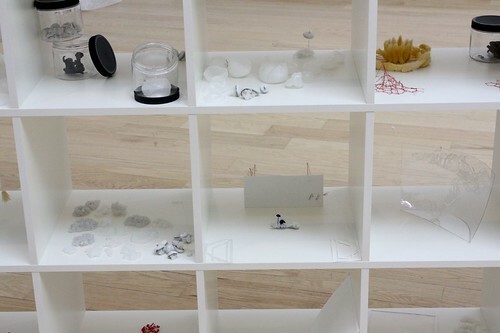 Miebach discussed materials in great depth during the workshop. She talked about reed as being a natural material which has a lot of pliability when worked with wet. Hot water makes the reed pliable faster, but cold water is also effective. Listening to her slide show, it was amazing to hear the incredible range of materials weavers have used throughout history: wax linen, pandan leaves (from a coconut tree), watercolor paper, reed, wire, gimp, bamboo, wood, garden hoses, plastic cable ties, etc. The contextualization she provided by all of her examples from history and contemporary artists provided the perfect launching pad for everyone to start to create their own weaves. I will admit that my own knowledge and perspective on weaving was vastly limited, and it was wonderful to hear about the incredible range of possibilities in this process. 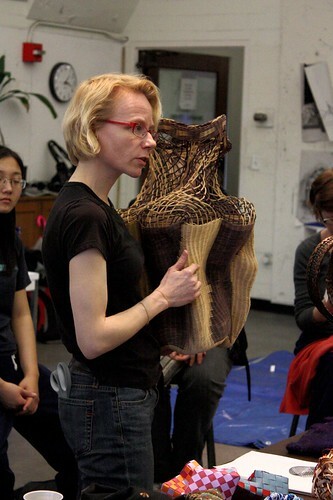 Miebach talked in depth about the process of weaving, and how in weaving you have to use your entire body. 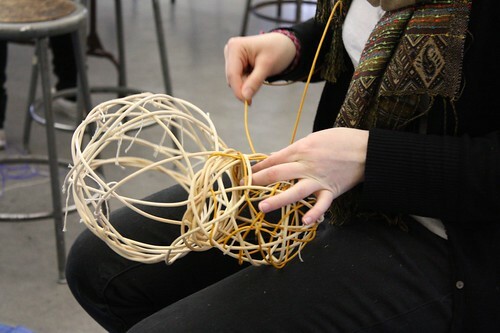 There are many ways to achieve the form: you can start from a solid object (like a box) and weave around the box to create the corm, and many baskets are woven on molds and even created in layers. Tension of the material is a major concern in weaving, a lot of the weaving process has to do with learning about the tension of the material. Combining multiple weaving techniques together is common as well. One aspect Miebach pointed out was that every woven form will reveal to you how it was make, once you know what to look for you can figure it out. She explained that the sign of a weaver is a person who will pick up a woven form and look at the bottom, since the bottom of the form is where the weave begins. Miebach also stressed that a lot of weaving is learned by making mistakes, since that’s how things get discovered and understood. She was also very encouraging about embracing mistakes, since they can sometimes have wonderful results. 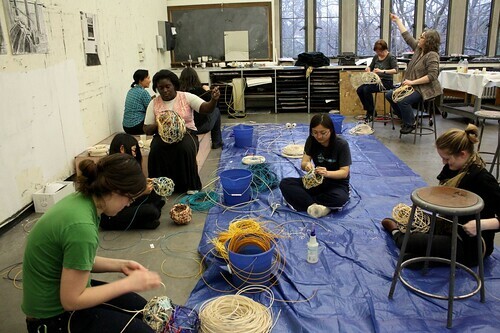 Miebach gave a thorough demonstration on how to begin a woven sculpture with the reed. This involved creating a round opening with the reed which would serve as the beginning point of the sculpture. From there, the random weave technique allows for tremendous flexibility in terms of process and form. I found working on my own piece during the workshop that the process was consuming and meditative at the same time. 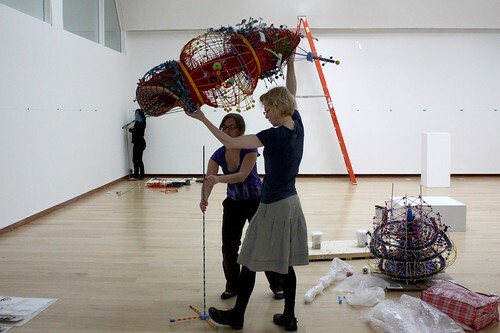 The physicality involved with weaving was also exhilarating as well, Miebach described earlier in the day that you “weave with your entire body”. 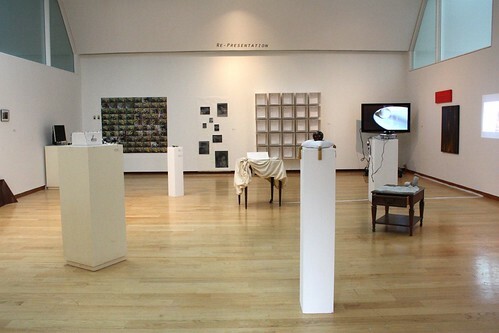 Pieces created by workshop participants. 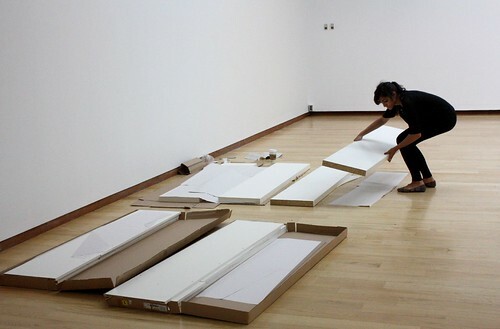 We were able to send everyone home with extra materials so the pieces could be finished at a later time. Miebach explained that one of the most challenging aspects of the learning process is that weaving is highly demanding of your time. Posted by claralieu in Applied Arts. 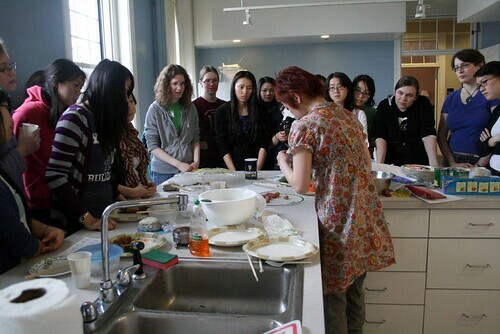 This past weekend we hosted the Japanese Bento Box workshop, taught by New York City artist Anna The Red. 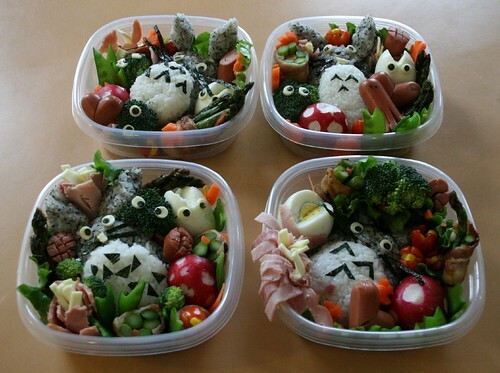 You can view a gallery of all of Anna’s bento creations on her bento blog. We had a lively crowd of 22 people at the workshop, which made for a wonderful and busy afternoon in the Lakehouse kitchen. Anna started us off with a handout of a simple pencil drawing which outlined the various parts of the bento we would be making. She explained that she always starts every one of her bento creations with a drawing to keep herself on track. 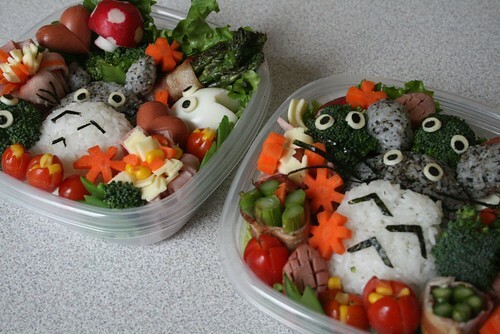 Bento boxes which feature cute characters in Japan are made by parents to entice their children to eat their lunches. The bento that she planned for the workshop had several components, each of which is made separately and then assembled at the very end. The individual pieces were a mushroom carved from a radish, carrot flowers, a ham & cheese flower, broccoli “soot sprites” from the Japanese animated film “My Neighbor Totoro“, a grey Totoro made out of rice, snow pea “grass”, a heart made from a hot dog, a flower made from a hot dog, a white Totoro made out of a hard boiled egg, and a flower made from carrots and asparagus wrapped in bacon. Each part of the bento involved a different technique. Anna had all sorts of simple tricks for how to create each of these pieces of the bento. She did a demonstration showing different ways of cutting hot dogs to transform them into flowers, an octopus, and a heart. An octopus is made by cutting long slits on one end of the hot dog and then dropping it in boiling water. In the boiling water, the octopus’ legs flail outwards. The hot dog heart is made by cutting the ends of the hot dog at an angle so that when joined together, thye form a heart shape. She made a polka-dotted mushroom by carving into a radish. The dots on the mushroom are made by just carving small dots on the top of the radish. 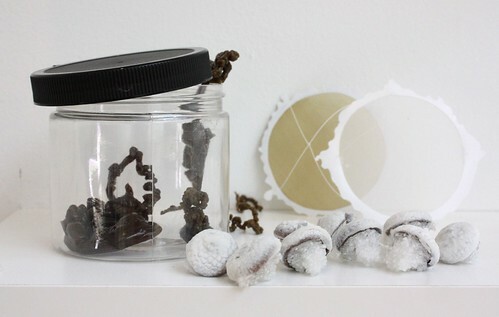 You can see a step-by-step “how to” on the radish mushroom on Anna’s bento blog. She had a great trick for dying the cooked rice grey: she grinds up black sesame seeds. When the ground black sesame seeds are mixed with rice, it turns to a grey color. The Totoro made out of rice is created by packing the rice into saran wrap, which allows you to shape the Totoro without getting your hands sticky from the rice. Another smart trick was using a piece of uncooked pasta to insert through the ham flower to hold it into place. The uncooked pasta actually will absorb some moisture from the ham, so that everything is edible. 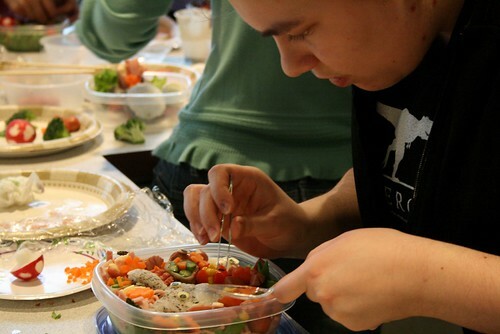 A workshop participant adds pieces of seaweed to her bento with tweezers. 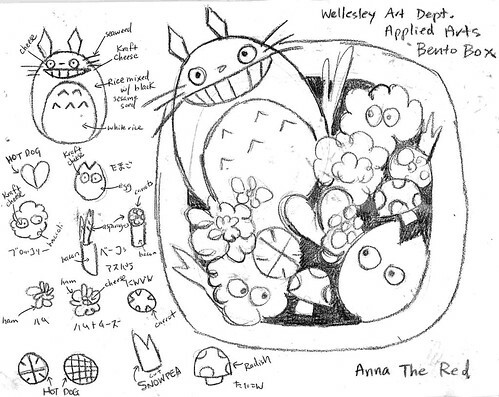 Anna explained that the smallest parts of the bento like the eyes/pupils and whiskers on the Totoro have to be placed on the bento after the bento has been fully assembled, this is to prevent these delicate pieces from getting moved during the assembly process. The pupils of the eyes are made by using a hole punch on a piece of seaweed. Seaweed is very susceptible to moisture, so picking up the seaweed pieces with your hands doesn’t work because of the moisture in your hands. Tweezers allow you to pick up the seaweed pieces and gently place them in your bento. The whiskers are created by cutting the seaweed with scissors. The eyes are created by using small bottle caps to cut into slices of Kraft american cheese. 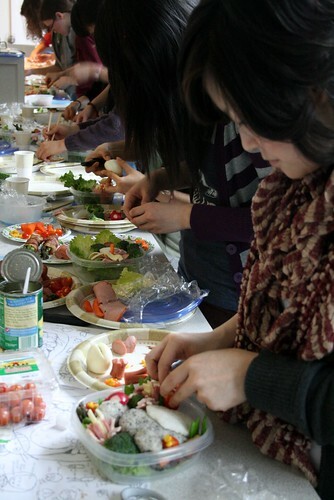 Workshop participants are busy assembling their bento boxes. Watching everyone assemble their final bento boxes was very exciting; although everyone had created the same components, no two designs were alike. Lettuce was used as “filler” for the back of the bento box, and Anna noted that you can place other pieces of food underneath certain pieces to raise their height in the bento box. The finished bento boxes created by the workshop participants; it’s amazing to think that everyone finished their creations within three hours! 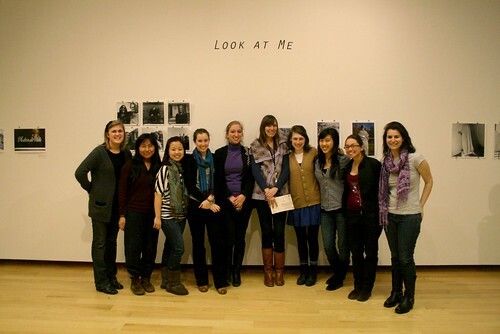 Posted by claralieu in Opening Receptions, photography, Student Exhibitions. 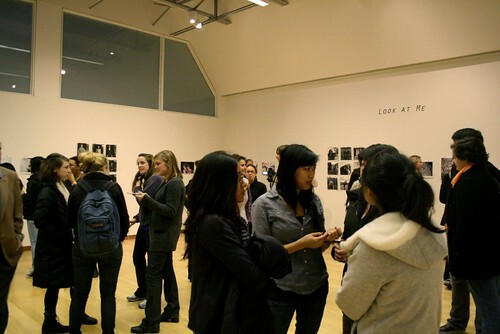 We had a terrific turnout this afternoon for the opening reception of ﻿the student photography exhibition “Look at Me”. 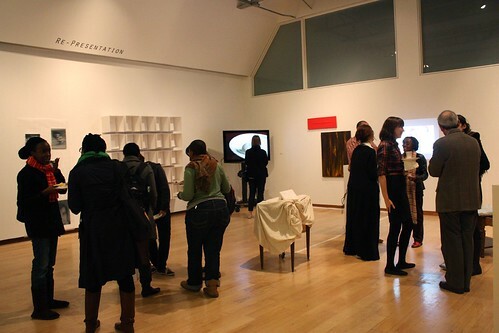 The exhibition is open through Feb. 25th. 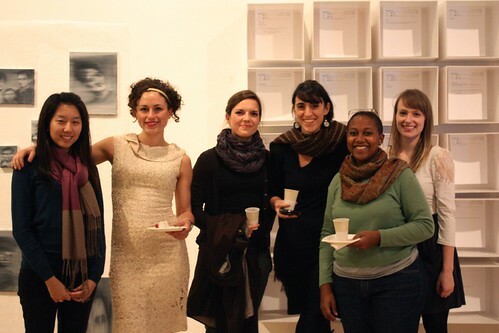 View more photos from the opening reception on our Flickr account. 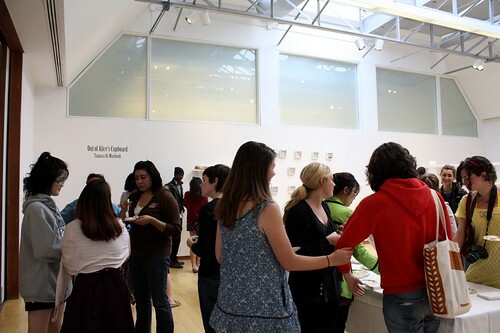 A lively crowd was present throughout the opening reception. Fall 2009 ARTS208 Photography course with Professor Christine Rogers. 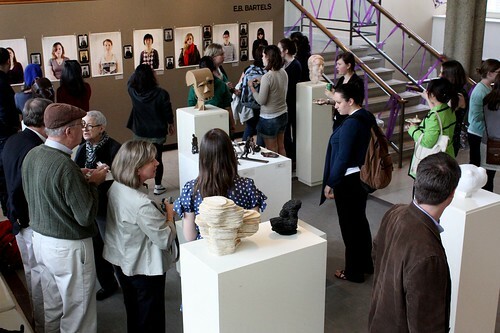 Professor Christine Rogers talks about the themes and ideas behind the exhibition at the opening reception. 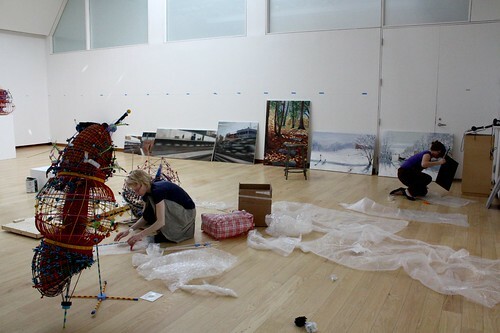 Emily Evans discusses the process and experience of curating the exhibition. 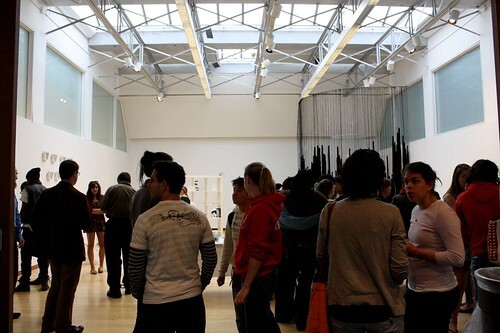 Posted by claralieu in photography, Student Exhibitions. 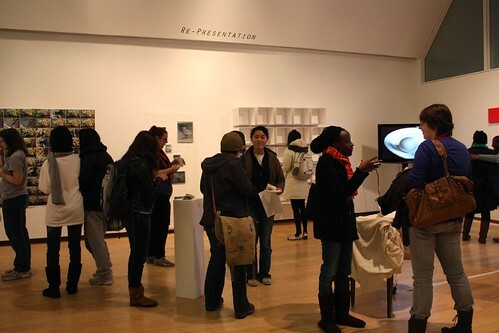 Today’s post is a guest blog post from Photography 208 Professor Christine Rogers. 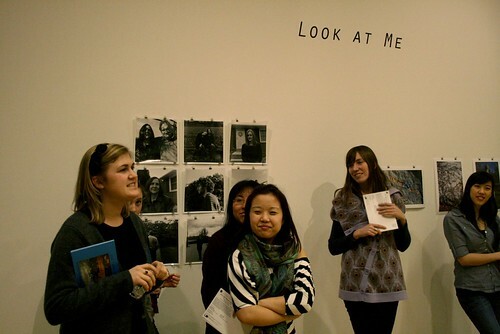 Her class put together the current exhibition in the gallery “Look at Me”, which has an opening reception this Thursday, Feb. 4, 4:45-6pm. Now that the show is hung on the wall I can’t help but be so proud of and inspired by my students from the Fall Photography 208 class. 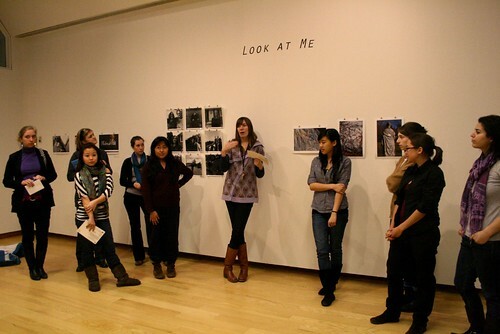 This show emerged out of a class assignment to curate themselves into a show. I wanted this to be a learning experience and for them to put together something that they could be proud of and they felt was representative of their work as individuals and as a group. The first phase was brainstorming and trying to come up with a theme to connect the projects. 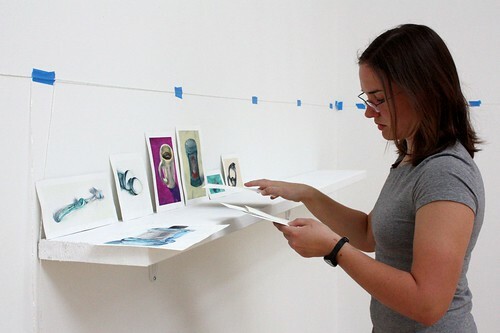 The second phase was to revisit the theme idea and instead organize the show visually and (somewhat conceptually) as throughout the semester projects evolved and the themes no longer felt appropriate. 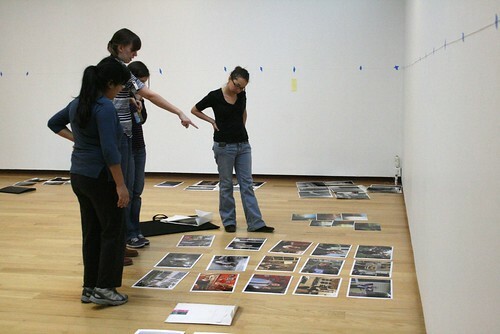 Hanging the work on the wall was another phase of the curatorial process as we discovered last week. We stuck to the original map that we made in class but we had to edit heavily as there was more work than we had wall space. Ultimately this was for the best as these decisions helped to create a stronger final show where the viewer can spend time with each edited body of work as well as look at this as a cohesive show. 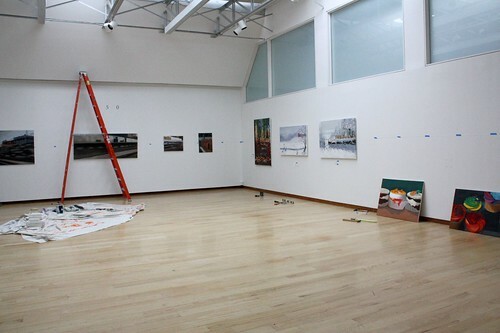 Thank you again to everyone who came out to help hang the show: Ji, Cecilia, Olivia, Sarah, Shannon, EB, Rayla, Eleri, Shirley and Emily. For those students who are studying abroad this semester, we will miss you on Thursday and we hope you like the installation!